By Peter Anderson 4 Comments - The content of this website often contains affiliate links and I may be compensated if you buy through those links (at no cost to you!). Learn more about how we make money. Last edited June 23, 2016 . Every year my wife and I, along with family, friends and about 1.82 million other people attend the Minnesota State Fair. It's the largest state fair in the nation by average daily attendance, and it is more than just your average local fair. It has just about everything you could imagine finding at a fair. It has tons of entertainment diversions from daily parades and local musical acts, all the way up to big grandstand shows by national acts. It has 4H shows and competitions, craft and fine arts competitions. It has a rodeo, and animal shows. All of the local news channels broadcast live from the fair for 2 weeks of the fair. There are hundreds of booths where you can buy all sorts of ‘As Seen On TV' type wares. And of course there are all the delicious, odd and unique foods. 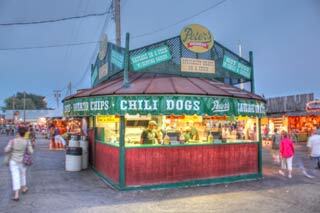 Every year the fair prides itself on bringing a variety of new and interesting foods to the fair. This year some of the more bizarre ones I saw were camel burgers and beef tongue tacos. While we don't eat all of the strange foods that appear every year, we do make it a point to attend most years, and we always have our favorite foods that we want to partake in like the cheese curds and Sweet Martha's cookies (Sweet Martha's makes almost 3 million dollars a year on their cookies!). The thing is, if you're not careful, the fair can turn out to be an extremely expensive proposition. So today I thought I'd share how we set out to save some money at the fair, and how we really didn't end up saving as much as we had hoped. 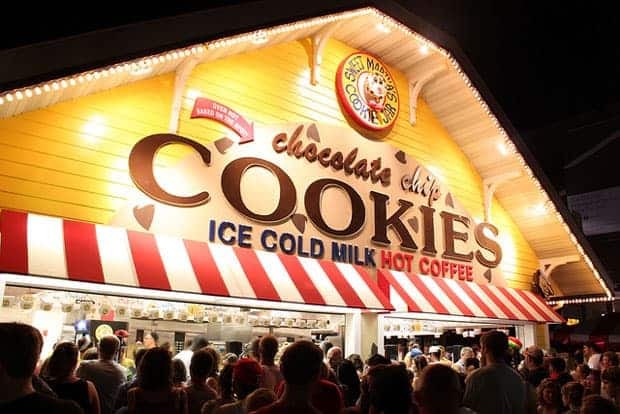 There are a lot of ways that you can save money when going to the Minnesota State Fair, and I'm sure if you're attending another state's fair, you can save in similar ways. Google is your friend for finding discounts! 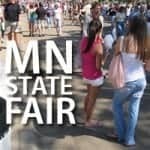 Buy discounted tickets before the fair: The MN State Fair has advance discount tickets available, in 2015 it would save you $3 on a $13 ticket price. You can also buy discounted ride tickets ($15 for a sheet of 25, save up to $10) before the fair to save more! 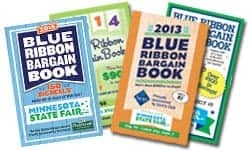 Use the fair's bargain book: The Minnesota State Fair has what they call a “Blue Ribbon Bargain B0ok” for $5 that you can use to save money at a wide variety of booths and food vendors at the fair. We saved almost $40 last year using the bargain book. Free parking: The fair and local mass transit offers a free park and ride program so that you can park at one of 30+ off-site locations, and ride the mass transit to the fair, and get dropped off right at the gate. Save $12-20 on parking! Download the fair's Android or iOS app to find food you have discounts for: The Minnesota State Fair has an app that helps you to find the foods you want to get, track down the foods you have discounts for and more. Free activities abound: One way to save a ton of money at the fair is just to take advantage of all the free activities that are available every year. They have daily parades, skateboarding shows, 4H competitions, fine art shows, concerts and so much more. While you could spend a ton on rides and shows at the grandstand, you could also attend and do all the free things at the fair and save a ton. Bring a bag with water/snacks: The fair allows you to bring in a bag or backpack, so you can bring in your own food, water and snacks. We usually bring a few bottles of water to save on drinks. If you want to save more, bring in some food as well! Go on a weekday or discount day: The fair will often have discounted admission on certain days, as well as having discounts for certain groups like veterans. Check the fair's website to see when discounts are to be had. Also weekdays often have discounts on rides and other attractions. Food discounts before fair close: Several other sites have mentioned that you can save on your favorite foods by going to the food building right before close where many vendors will be selling off the last of their food with huge discounts. 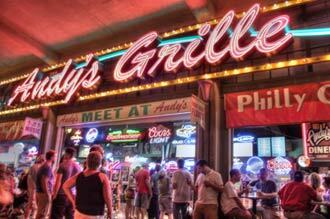 Get a bite to eat before you leave! Those are a few ways that you can save at the fair. So how did we do at the fair, and how much did we spend and save? How Much Did We Spend At The Fair? So after we buying our tickets at a discount, and using the fair's Blue Ribbon Bargain Book, how much did we end up saving? Here's what we spent this year. So we ended up spending about $138 at the fair this year, after $37 in discounts. Not too bad I suppose for spending the entire day at the fair. We could have done a lot better but my wife found some gifts at the fair for others, and a t-shirt for herself, which added $57 to the bill. Without those things we'd have been under $100. Here's what we spent at the Minnesota State Fair couple of years ago. It was a similar total amount, although we spent less time at the fair that year, and didn't use the discount book or pre-sale fair tickets. We got less stuff but paid about the same because of no discounts. Want to see what others have spent? Check out what David of YoungAdultMoney.com spent at the fair. When attending the state fair this year we were making an effort to take advantage of all the discounts that we could find. From buying our tickets in advance, to buying the fair's discount bargain book. While we did reasonably well using those things, saving almost $40 in the process. We also left some other savings on the table, however. For example we didn't use the free park and ride, and we bought quite a few things that didn't have discounts. We also realized that just because you're using discounts and coupons while attending an event like this, it doesn't mean that you're necessarily being frugal. Even with all the discounts we used, we ended up spending more at the fair than we did last time when we didn't use discounts. Sometimes having discounts allows you to rationalize spending even more money than you might have otherwise. Something to keep in mind. Have you ever found that you spent more when attending an event in part because you were using discounts or coupons – or because you got something for free? 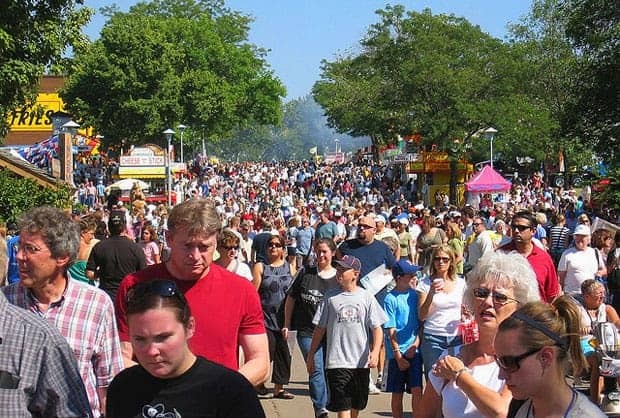 Have your own savings tips for the Minnesota (or other) State Fair? Tell us about it in the comments! Going To The Minnesota State Fair Is Expensive! How To Avoid Spending Too Much. Save money at the movies this summer by implementing the advice in these helpful tips. 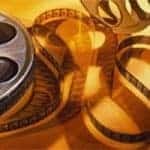 Time to save at the silver screen! Last Edited: 23rd June 2016 The content of biblemoneymatters.com is for general information purposes only and does not constitute professional advice. Visitors to biblemoneymatters.com should not act upon the content or information without first seeking appropriate professional advice. In accordance with the latest FTC guidelines, we declare that we have a financial relationship with every company mentioned on this site. Great write-up on the Fair! We also get cheese curds and Sweet Martha’s cookies every year. My wife did try a gyro that looked (and according to her, was) absolutely amazing. We use the park and ride every time we go to save money. It’s fairly convenient tho there is always a ton of people trying to find parking at the park & ride (kind of ironic). We will “invest” in a Blue Book next year as well. We may try the park and ride next year, the only thing we don’t like about parking at the fair is the cost, and the long wait to actually enter the parking lot. Fairs are such huge money sinks that I’m almost afraid to go. Especially now that I’m old enough to be terrified of rides that are consistently broken down and put back together. Yikes. It helps that Phoenix is stupid enough to have its fair in the dead of summer. Uh, thanks but no thanks. Still, I loved fairs as a kid. We didn’t have discount books, but my mom would have us go on preview night. Admission was half off, and you got pay-one-price rides. Something like $15 for a bracelet, and off you went for the evening. She was also smart enough to only let me eat after I had thoroughly used my bracelet. Lest I get too nauseated once food was in my belly. And even then, it was understood that I’d choose carefully. We’d look at all the food booths and then I could choose two or three treats. Usually corn on the cob, funnel cake and some cotton candy. All in all, she was able to keep it fairly frugal. The only exceptions were the years that my dad decided he wanted to go. It was inevitably *not* preview night. So not only did we pay a second time, but we also went at full price. And he was more happy to spend money on things than she was. 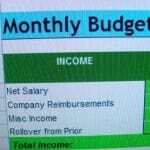 I am going today and we are only going to bring in cash, the amount we want to use and not any more. We rarely use credit cards. We use cash,and I’m plus sized and not into rides that crush me anyhow. But we look at animals, go into the buildings, do free things,then spend money on foods and games a bit. We know it’s expensive but it is only once per year,and last year we saw a show. So spent more. However, this time we plan to spend $150 or less on everything.